Mission Specialist Steve Bowen works outside the International Space Station's Quest airlock during the first spacewalk of STS-133. HOUSTON – A pair of spacewalking astronauts working outside the International Space Station zoomed through their mission's first spacewalk today (Feb. 28) despite a system failure that temporarily shut down the orbiting lab's robotic arm while someone was riding it. Discovery shuttle astronauts Steven Bowen and Alvin Drew were outside the space station working with a huge ammonia pump – a refrigerator-size piece of the station's cooling system – when the robotic arm went offline. Bowen, stuck holding the ammonia pump at the end of the 57-foot (17-meter) robotic arm, simply had to wait it out. "I'm fine as long as it's not too much longer," Bowen said. Turns out, he didn't have to wait too long. Soon, crewmates inside the station fired up a backup system. "I've got a hot-shot station crew that moved this robotic work station in a second," shuttle astronaut Michael Barratt of NASA radioed the spacewalkers. The robotics system glitch occurred inside the station's seven-window Cupola module, which gives robotic arm operators panoramic views of the orbiting lab's exterior while moving its robotic arm. It shut down as station commander Scott Kelly and Barratt were maneuvering Bowen to his next worksite. "We're only 15 minutes down, so that was a nice, quick recovery from that," said Discovery astronaut Nicole Stott, who helped choreograph the spacewalkers. 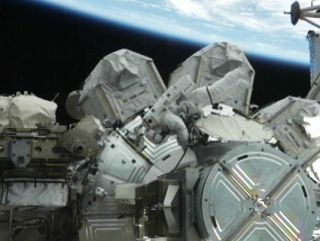 The delay pushed the spacewalkers about 20 minutes behind schedule, but Bowen and Drew managed to make up some of that time during later tasks. Robotics officers here at NASA's Johnson Space Center were eventually able to get the Cupola work station back up and running, and kept it in a back-up mode for the rest of the spacewalk. ESA Astronaut Paoli Nespoli snapped this photo of Discovery shuttle astroanuts Alvin Drew and Steven Bowen during the first spacewalk of their STS-133 mission on Feb. 28, 2011. Aside from the robotics control shutdown, the first spacewalk of Discovery's STS-133 mission went relatively smooth. A second spacewalk is set for Wednesday (March 2). Today's spacewalk ended at 5:20 p.m. EST (2220 GMT) for a total of 6 hours and 34 minutes of orbital work. Bowen and Drew installed a power extension cable, moved the broken ammonia pump to a new storage point, attached a wedge under one of the station's exterior cameras and performed other maintenance activities. Drew even captured some of the vacuum of space in a metal bottle for a science experiment sponsored by Japan's space agency. The container will be returned to Earth at the end of Discovery's STS-133 mission. Inside Discovery, Stott played the song "Message in a Bottle" by the Police to commemorate the occasion. While working outside, Bowen and Drew caught some unique views of the space station, which is currently home to an international collection of spacecraft from four different space fleets. The spaceship mix includes: a European cargo ship called the Automated Transfer Vehicle 2 (ATV), a Japanese cargo vessel known as HTV-2, a Russian cargo ship, two Russian Soyuz crew capsules and the shuttle Discovery. "I've decided the HTV and ATV are both big," Bowen joked as he stood at the tip of the station's robotic arm to retrieve the broken cooling pump module. Today's spacewalk was Bowen's sixth and the first for Drew. Bowen, a veteran spacewalker, was a last-minute crew replacement for astronaut Timothy Kopra, who was the STS-133 mission's lead spacewalker. Kopra was injured in a bicycle accident less than six weeks before Discovery's launch, forcing him to sit out on the orbiter's historic final flight. Kopra remained involved in today's spacewalk, however, by providing support from mission control here at the Johnson Space Center. "You're a good man for the job," Kopra radioed to Bowen prior to the start of the spacewalk. At the end of the spacewalk, Kopra was one of the first people to congratulate the two spacewalkers on a successful outing. He especially congratulated rookie spacewalker Drew. "Congratulations on a stellar job on your first spacewalk," Kopra told Drew. "Good job, dude." Drew also became the 200th person in history to work in the vacuum of space, according to NASA officials. Shortly after Bowen and Drew returned inside the space station, Mission Control radioed the station and shuttle crews to say that Discovery's STS-133 mission will be extended an extra day. The extra day will give the crew the opportunity to complete more work on a storage module that will be attached to the station's Unity node tomorrow.